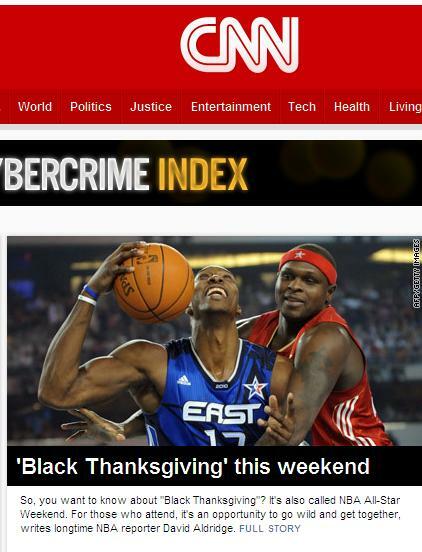 On the homepage of CNN.com today, David Aldridge talks about "Black Thanksgiving," otherwise known as NBA All-Star Weekend. Now I won't wonder why Thanksgiving was the holiday chosen for the metaphor, since the weekend of partying would be more akin to, say, St. Patrick's Day, but nonetheless, I'm just wondering why, of every possible all-star photograph CNN could have featured, they chose this extremely weird shot? What exactly are they doing? Why is Dwight Howard holding the ball like that, and smiling so weirdly? I'm thoroughly confused. Oh well.